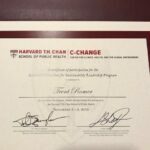 In June of 2018, I applied to the Harvard’s Executive Education for Sustainability Leadership program. The program is a 5 day educational event at Harvard University on sustainability and how to incorporate it into organizations. When I was accepted into the program, excitement to be exposed to this level of education was combined with “first –time” nervousness in going off to college. It’s been 25 years since I have been on a college campus. My wife & kids and my company Clear View Bag are to thank for supporting me in this venture. Sixty people from all over the world gathered at Harvard. A wide mix of organizations and experiences made up the group: public and private businesses, government agencies, education, healthcare and non-profit firms. From national brands like Amazon, Chick-fil-a, Gap, NASCAR, the FBI, MLB and Wynn Resort Hotels to smaller companies like Clear View Bag were all present to learn about sustainability leadership. Faculty ranged from Harvard professors to other guest speakers and lecturers. It was an amazing combination of people gathered to learn, be challenged and help push forward the sustainability movement all under the Harvard brand. 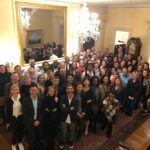 Here is a photograph of a majority of the attendees and staff who attended this years program at Harvard focusing on education of sustainability. Incorporating sustainability into an organization requires change. Thousands of successful ideas were analyzed and the program outlines the methods to achieve the best results in changing organizations. Below are the major topics taught and experienced. Two Operating Systems: The very first commentary relayed was we would experience things we already knew, but we would be taught to re-think them. That idea made increasing sense as the week unfolded. Successful ideas that came to fruition were found to involve two organizational networks that are constantly in play: an adaptive network and a hierarchical network. The adaptive network is the innovative group constantly coming up with ideas to push the organization forward in new ways. The adaptive network is not as gated by budgets, time-lines and the structure of the organization. The hierarchical network is the command and control center that watches budgets, time-frames and keeps the organization going from a structural and “core business” perspective. The best ideas and best companies utilize the benefits of both networks. The networks work in concert in the right sequence and the right amounts to push new ideas forward within the budgetary and hierarchical controls of the organization. The success of an innovative idea is best seen when the interaction of these two networks is based on trust, psychological safety in stating ideas, shared literacy and empathy. When this occurs, ideas flow through the system and tend to avoid friction. The recognition of these two systems operating in all organizations was a central theme to the week. Sustainability objectives require new directions and these two operating systems working together help to create change. The SDG’S: In 2015, the United Nations (UN) announced 17 Sustainable Development Goals (SDG’s) for all member nations to strive to achieve by 2030. The SDG’s “provide a shared blueprint for peace and prosperity for people and the planet now and into the future.” (https://sustainabledevelopment.un.org/sdgs) The SDG’s drive governments to create and implement policies to accomplish the over-riding goals. While the SDG’s are not legally binding, every country is monitored and scored based on progress. Countries pursuit of these goals drives some of the cultural and societal changes we all experience in our daily lives. The policies influence education, businesses and the public to create change. Sustainability goals for individual businesses should be aligned with the SDG goals. Complex System Mapping: “The solutions of today are oft times the problems of tomorrow.” This quote from the program represented the complexity of the many issues we face. Over- simplification of more complex problems can result in more problems down the road. System mapping problems brings all stakeholders to the conversation seeking solutions. Mapping the problem requires psychological safety for free flow of ideas and patience to create multiple iterations of the map to capture all potential causes and effects. Mapping problems pushes our mental capacity beyond the norm. In the end, strategic clarity is found through mapping the complexity. Sustainability initiatives require organizations to change. Being able to map the change for best courses of action is critical to success. Only by changing the system do you really know the system. Idea Flow Mapping: Once ideas from system mapping are discovered, they enter an idea flow map. The ideal flow map moves the idea from inception to completion (or abortment) by bouncing back and forth between the adaptive and hierarchical systems. The two systems work together to strategically align themselves, sense the next steps, seek early adopters, de-risk through pilots, iterate versions of the idea, seek larger interest, activate larger hierarchical network for decision making and potential approve to scale. The flow creates a traceable lifecycle for ideas as they flow through the organization. Bio-mimicry: Bio-mimicry seeks to design processes and products using nature as its model. The planet has been in existence for 4.5 billion years and has figured out how to survive and thrive. In nature, there is no waste as everything is a nutrient and a feedstock for another. Nature is constantly sensing the environment through countless “receptor” and “antennae” feedback loops. Emulating nature will help humans to move towards an economic system that creates conditions increasingly conducive to life. An example is a Peacock gets its colors from its structure, not from dyes and potentially harmful chemicals. Bio mimicry makes our connection to nature very real. Thinking in those terms can be a foundational mindset for any sustainable movement within organizations. Purpose led business models: “Unless you’re an astronaut, it’s not the work we do that inspires us. It’s the cause we come to work for.” (Start with Why, Simon Sinek). In comparison to the conventional business model, a purpose-driven model drives stronger loyalty from clients and employees, is more efficient, has a longer term in focus, is more human in its approach, promotes innovation, is more circular in nature and is more flexible and welcoming. Purpose driven business models that are truly authentic out-perform their conventional business model counterparts. Purpose driven organizations fit the narrative for companies moving in a more sustainable direction. These are just a few of the ideas relayed and demonstrated. The connections made with the 60 plus people through the week were a true source of inspiration, learning and motivation. We ate together, learned together and were challenged together to form a bond that will outlast the week that was. The idea behind the coursework was to apply it to our own organizations. To do that, we broke into pods of four multiple times. The pods got to know each other very well and by the end of the week, understood the challenges each pod member faced within their individual situation. My understanding of the coursework could not have been to the extent I have without them. Their feedback, patience and guidance truly helped me understand what I need to do. I am very thankful for their interest in me and consider them friends for life. Thanks to Darcy Renn (Albertsons Companies), Elizabeth Koprowski (FBI) and Eric Abrahao (EAA Group Brazil). It’s now up to us to take what we have learned and start running. Many thanks to the entire faculty and my classmates. The week at Harvard affected me to my core. I will be forever grateful to this experience. It has changed the way I view the planet and our company’s role in it.